Nothing to it, said Mom. Just like play dough. Make little balls. Like this. Yes. Good girl. And drop them into the pot very gently. They’re like little pearls, said I. White lotus, said she. Bua loi — floating lotus. But, Mom, the water in a lotus pond is clear not milky, said I. She paused. Isn’t it prettier, though — white on white? Yes, Mom. It is. Very pretty. Then she started singing a song about white lotus in a pond, Bua Khao (บัวขาว). Her voice, just like Grandma’s, was exquisite. By the time we were done making this dessert, I’d learned all the words to the song. I was only three at that time and recall nothing of what took place that day. Dad happened to get the whole conversation and me singing the song for the first time — struggling with pronunciation from the beginning to the end — on tape. The two people are now gone. But I still sing Bua Khao from time to time — not any less poorly than I did when I was in preschool, sadly. And I still make this dessert of white glutinous rice dumplings in sweet coconut cream often. You see, if there’s ever any one dish the thought of which makes my heart bubble up with nostalgic joy, it’s this. Composed by Prince Bhanubandh Yugala and M.L. Puang-roi Abhaiwongse  as a soundtrack for a 1937 movie, Bua Khao was an oldie even when Mom was a kid. Grandma must have loved this song and taught it to Mom. Mom then taught it to me. This song has been sung in our family for many years. Bua Khao is a very short but beautifully written song. It depicts a simple, tranquil scene of someone paddling a boat in a big pond, captivated by the immaculate beauty of white lotus, and enjoying the sight of fish swimming in clear water and bees collecting pollen from lotus flowers. My favorite? The one by Hong Kong’s iconic singer, Frances Yip. I just adore her voice.
) by, uh, me when I was not quite three years old (you can hear Mom telling me to sing a little more loudly into the mic and helping me when I forgot the words). Pronunciation and intonation were an issue. I couldn’t pronounce consonant clusters to save my life. My r and l came out as y, and s as ch. I guess I got into linguistics mainly to figure out what the heck was wrong with me. But, hey, I was polite (never mind the heavy breathing); I did say hello before I began. I might have even curtsied, but I can’t remember. All you have to do is add some room temperature water (do not use hot water as it will instantly cause the flour to gum up) to a bowl of glutinous rice flour — just enough to allow you to form the mixture into a smooth ball of dough that doesn’t stick to either your fingers or the bowl. Then you pinch off a little piece of dough and roll it with the tips of your fingers into a tiny ball, about one centimeter in diameter. Make sure to work quickly, or at least keep the dough ball covered at all times, for exposure to air causes the dough to dry out and make it difficult for you to form little balls without them crumbling. 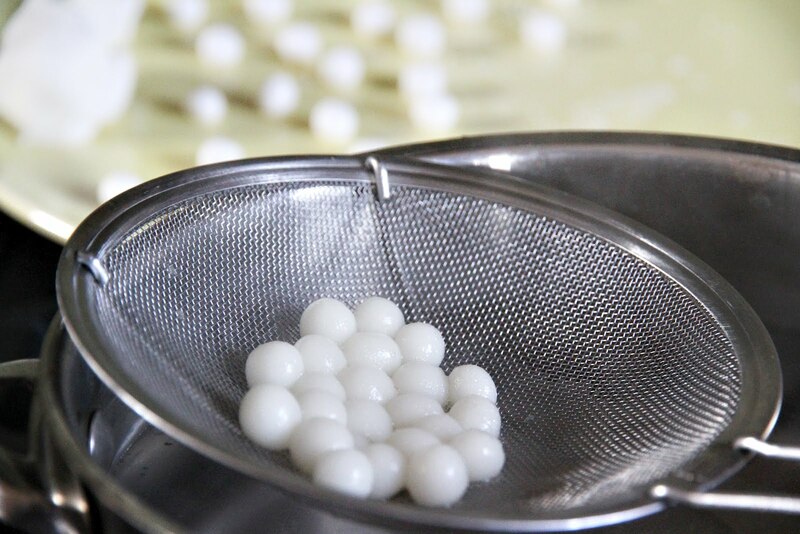 Once the little pearls are formed, though, they’re okay; you can leave them out for a while. How much flour? For a couple of servings, half a cup (66g) of glutinous rice flour should be enough. Then you bring a pot of water to a gentle boil and drop the little dough balls into the water slowly and carefully. They’ll sink at first, then float to the top signaling to you that they’re ready to be fished out with a slotted spoon. Then you plunge the cooked dumplings into a bowl of cold water to keep them from sticking together. 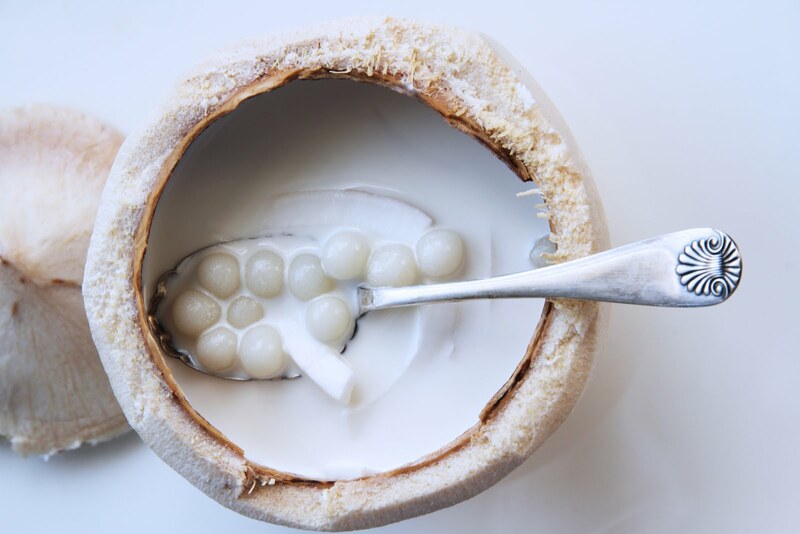 Then you pour some coconut milk into a pot, sweeten it to taste with sugar and round out the flavor with a tiny bit of salt, bring the whole thing to a gentle boil, add the drained rice dumplings to the pot and let everything cook gently to allow the dumplings to absorb some of the sweetened coconut cream. After about a couple of minutes, your “floating lotus” is ready. If you want to get fancy, poach a couple of eggs in the coconut milk while it’s simmering. 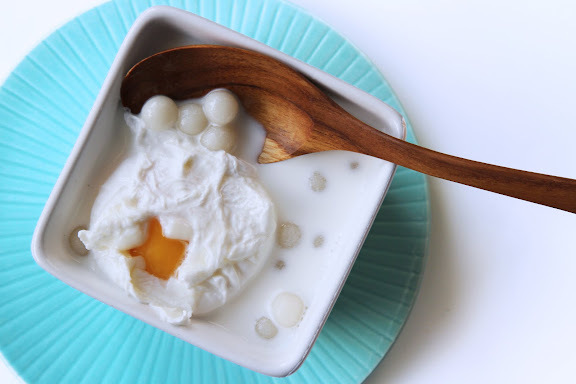 Poached eggs in dessert may seem odd to you, but it’s a combination that is much loved by the Thai. You can also add thin slices of the meat of what I call ‘adolescent coconuts‘ to it for texture and extra coconut flavor. Khanom Bua Loi is great warm, at room temperature, and even slightly chilled. A hyphen is added to emphasize the syllable break and prevent mispronunciation. Oh my goodness, I’m awe struck, what a beautiful post and so precious to have those happy memories with your Mum and Dad. I love the way you’ve combined a recipe/ memory with such tenderness. These “floating lotus’s’ will be making an appearance in my home soon. Thank you! Leela, I love every post you’ve made but this one moved me to tears. You have a real gift – for cooking, for writing and for photography, but also for imbuing all of these with real emotion. wow, thank you for the recipe, the story, and the GORGEOUS music – perfect way to end my evening!!!! iʻm FLOATING!!!!! Can you share the lyrics? Yes we make similar recipe called maniputtu in Kerala, were rice flour dumplings served with sweetend coconut milk. Looks awesome. Wow, listening to Francis Yip singing thai song, that’s priceless! i will try to track down that cd when i’m in bangkok again. that’s a lovely story. when I was young, my mum didn’t really allow her into the kitchen, because she says we’d only make a mess. the only thing i ever remember her allowing us to do because it was just too impossible to mess up, was glutinous rice balls. 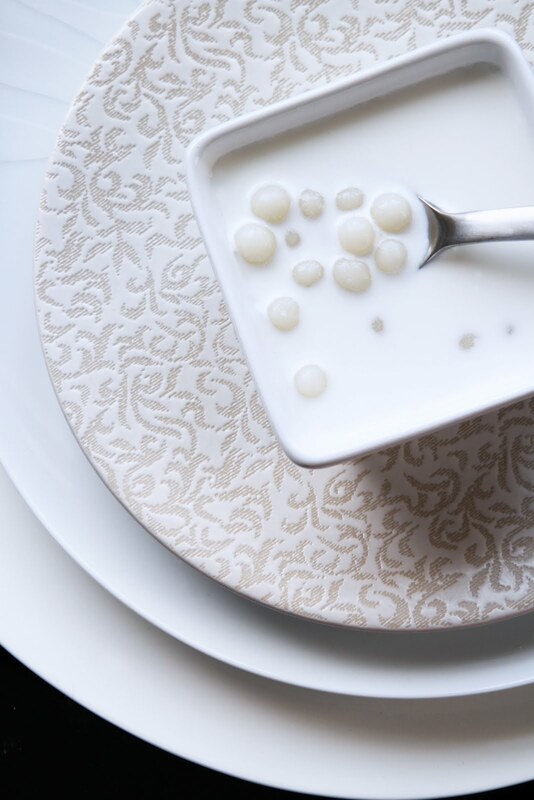 it was done chinese style though, in sweetened ginger syrup, but still kind of like this,just plain sticky rice flour balls in a sweet soup, no fancy peanut paste or sesame filling. Thanks again Leela, I check your blog almost daily for updates and I go through your archives as well. It’s a great site, and I’m looking forward to the Nam Prik recipes you promised, as well as your cookbook which I will definitely buy! Thanks for the report and the kind words, Tom.